There are two separate and very different schools of thought when it comes to James Joyce’s uber-novel, Ulysses, in twentieth century literature. One is that it is the greatest book ever written and changes the reader’s whole attitude to how books should be written and read whilst the opposing view is that it is an impenetrable bore and merely a dictionary in the wrong order. I subscribe to the latter view and was forced to read the damn thing during my tenure as a student and this play was a means of seeing whether I had perhaps judged it too harshly. I have attempted to read it since the time I was force fed it to see whether it became any clearer, but to little avail and seeing this show was a way of discovering whether its prizes would eventually reveal themselves to me. Unfortunately the theatre this production is set in is the very lecture theatre where I sat and found more interest in the plain walls and an errant crack in the ceiling than Joyce’s stream of consciousness discourse. Written by Donal O’ Kelly ,directed by Sorcha Fox and performed by Katie O’Kelly Joyced is a swift flight through Dublin in 1904, the year Ulysses is set in. On her journey which begins with Kelly in a very fetching pair of black wings she takes in a whirlwind tour of the city encountering the people who became the basis for the main characters in Ulysses as well as Joyce , his wife Nora-the inspiration for Molly Bloom- alongside other members of his family. Kelly gives a great performance dipping in and out of characters seamlessly and capturing the essence of them intuitively. It is clear she has studied her subject matter and can imbue the characters with their defining nuances and conjure up something totally believable. The dialogue is delivered at a breakneck speed and I must admit I found it hard to follow-much like Ulysses- and eventually gave up and submitted to just enjoying the performance without having a clue what was going on. 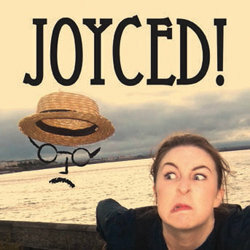 Devotees of Joyce will love this show and there were many gathered outside before the performance discussing the book and the whole Joycean myth. Unfortunately it merely convinced me that despite a desire to get to grip with the book this show convinced me that perhaps I should continue to read literature I actually understand and enjoy and leave Ulysses to these converts and scholars.